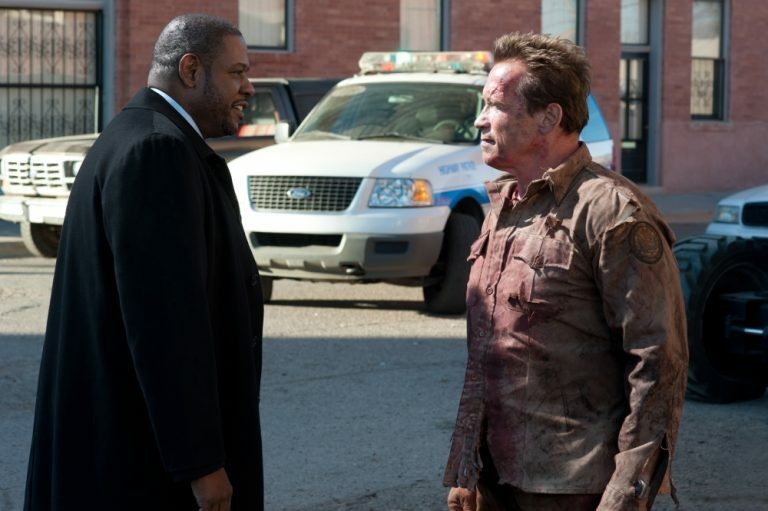 Forest Whitaker and Arnold Schwarzenegger in 'The Last Stand'. Each generation of action films brings something new to the genre, but it wasn’t until the 80’s when Arnold Schwarzenegger blasted onto the scene that action heroes became larger than life. Hollywood no longer needed to sew muscles into Superman’s costume – the costume was eschewed completely – opting instead to have Conan and Rambo wow audiences with their awesome physiques that looked nigh impervious. After a decade of “I’ll be back” and “Get to the chopper”, it seemed like audiences were ready for a more vulnerable action hero, which they received in Bruce Willis’ John McClane. Tastes may be shifting back, however, after so many years of unintimidating Neo and Bourne, and too much willing suspension of disbelief with tiny heroines taking on giant attackers. The Last Stand offers a nostalgic look back at the ultra-violent actioners of the past, and, while it tries to be just a little more than it’s worth, this film is still a success by almost any standard. Gabriel Cortez (Eduardo Noriega) is the head of the most powerful drug cartel in Mexico. Incarcerated and prepared to be moved to a new location, Cortez is under the watchful eye of FBI Agent John Bannister (Forest Whitaker), who loses Cortez after a well-organized and daring escape. Driving a modified, powerful Corvette, Cortez must get from Las Vegas to a small border town called Sommerton, where his crew is preparing a special way to get across to Mexico. The only thing standing in their way is Sheriff Ray Owens (Arnold Schwarzenegger) and his bored and inexperienced deputies. The violence in The Last Stand is over-the-top and pervasive, which is something to consider for those affected by recent events in the United States. Directed by Jee-woon Kim, who previously directed the ultra-violent Korean film I Saw the Devil, The Last Stand is unflinching in its violent creativity. People are shot in the face, resulting in a fine, red mist blasting into the air. Other times, people are torn in half by a hail of high-caliber bullets. Some people are simply blown entirely apart, with limbs comically landing on other characters. Many will find this distasteful. Just as many will find this to be the antidote for too many films that require audiences to fill in too many blanks. While the violence is visceral, there is also a cartoony quality to the entire film that helps remind some of the more sensitive audience members that the film represents nothing close to reality. Despite Owens warning of a dangerous shootout in the streets, townsfolk refuse to leave, citing the dangerous lives they already live by eating high-cholesterol meals. When bad guys get shot, they die horrifically. When good guys get shot, it’s just a flesh wound in a non-vital area. And when the mayor asks Owens to take care of his car, it’s taken care of. So while the gunplay is taken deathly serious, The Last Stand manages to come off lighter-hearted and more fun than expected. This isn’t Schwarzenegger’s best by a longshot. His acting is a little stiff, and his movements are even stiffer. It also wouldn’t be a stretch to say that his film pedigree is unfairly weighting the scales against what is otherwise a just-above-average movie. Fortunately, The Last Stand is also far from Schwarzenegger’s worst, and it’s simply comforting for audiences who grew up watching his films to see his face in a familiar space once more. So while he never says his trademark line, he’s definitely back.